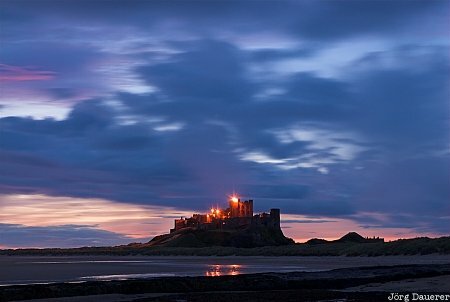 Bamburgh Castle at the coast of the North Sea before sunrise in front of a colorful morning sky in Northumberland, United Kingdom. This photo was taken in the morning of a rainy day in September of 2007. This photo is part of the exhibition Castles (June 2012). This photo was taken with a digital camera.